When entire communities come together, restoration results can be enormous. Anne Arundel Watershed Steward Academy’s (WSA) Clean Water Communities (CWC) program connects neighborhoods with the tools to reduce water pollution and improve the health of our waterways. 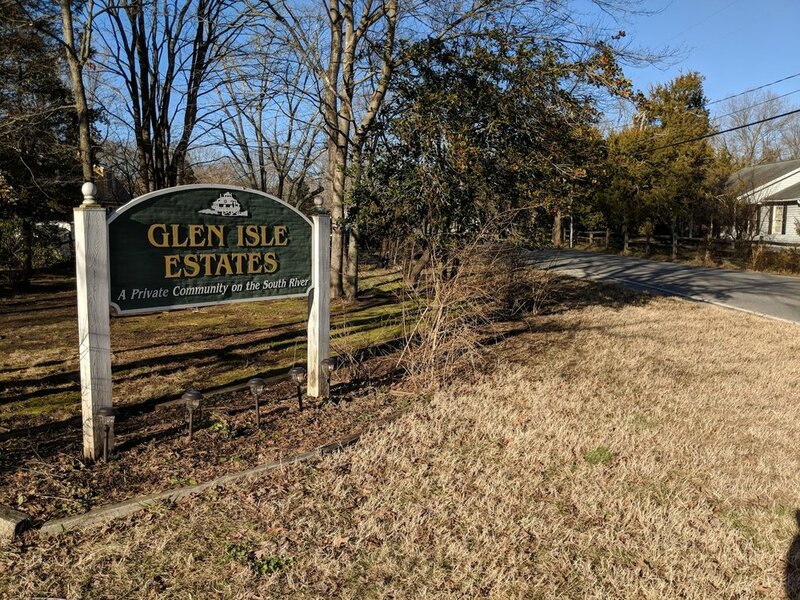 In Glen Isle, Maryland, a community located on the South River was concerned with degrading water quality with seemingly no end in site. “Every next year was worse,” said Michael Wagener, a Master Watershed Steward who lives near the end of the South River. Entrance to Glen Isle. Credit: Michael Wagener. Glen Isle is an older development, designed so that all stormwater runoff drains downhill into the River in pipes or on roads. Wagener knew that the South River was being impacted. Hearing about AAWSA at a local community event and and impressed with their achievements, Wegner and his wife took the Master Watershed Stewards course and were certified in 2011. Two other community members followed suit and with four Master Watershed Stewards already certified, Glen Isle was ripe for a community effort to tackle the water quality issues in the South River. The CWC program offers access to training, technical assistance, a community-wide environmental assessment, and individual yard visits, along with funding, to help residents take action to improve their water. Usually two residents of the community are required to take the Master Watershed Stewards course, but since Glen Isle already had four Stewards, they were ready to jump into the other phases of CWC. From November 2017 to January 2018, AAWSA contracted a trained expert, South River Federation, to complete a comprehensive Community Assessment, determining the pollution sources and opportunities for environmental restoration within the community. Alongside the Assessment, the Master Watershed Stewards were responsible for recruiting 10-15 Community Stewards who would assist them in educating community members on the results of the Assessment and implement behavioral changes identified in the Assessment to reduce pollution. After the Community Stewards completed 15-20 hours of training in March 2018, including a bus tour of local restoration sites, they were able to identify three behavior changes they felt would work for the community. These changes are called Habits that Help. First, right after their training and through the summer, the Stewards started an animal waste initiative to prevent dog and goose waste from ending up in the river. They handed out flyers, sent out newsletters, knocked on doors, and created bagging stations so that their neighbors would understand the importance of picking up after their pets. 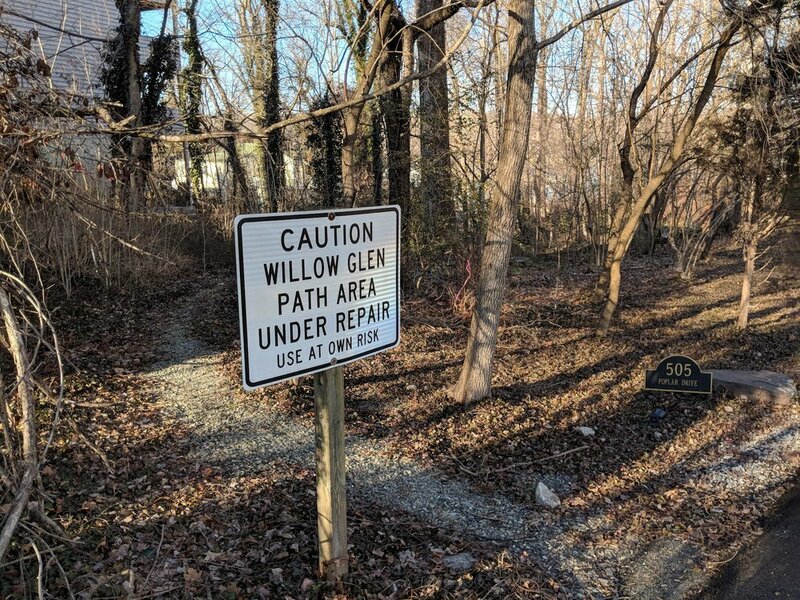 A sign for a pathway in need of restoration. Credit: Michael Wagener. In September and October, the Stewards created an “Ivy Army”: neighbors who volunteered to help cut down English ivy. Again the team knocked on doors and educated the community on invasive species, and organized groups to cut down ivy in neighborhood backyards. In the spring of 2019, they are planning a “Vine and Wine” where the volunteers will cut down vines at the beach and socialize afterwards. The Stewards have invited the volunteer families and are excited for kids and local high school students to get involved. The third project will help neighbors replace old septic tanks. This spring, Stewards will be consulting with individual community members on how to apply for partial funding or a cost share for a new tank that is at lower risk of leaching into waterways. Last year, when their community clubhouse septic tank suddenly collapsed, Wagener said his training prepared him to apply for and receive a grant. “Because of our involvement with WSA, we knew the best available technology for septic tanks, and within three days we were able to secure funding for our clubhouse septic tank,” explained Wagener. 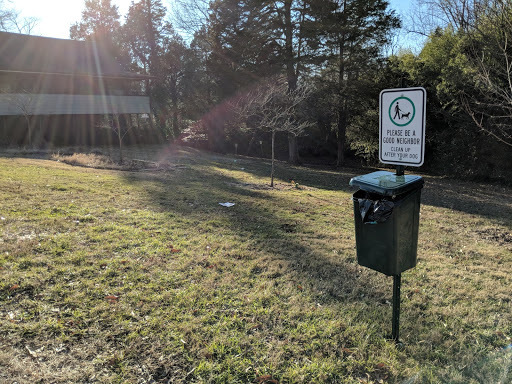 The yard around the club house, now with a pet waste bagging station. Credit: Michael Wagener. While many neighbors have already pledged to implement Habits that Help, the Stewards’ work is not done yet. The goal is to have 20% of the community sign on to the Habits. The last requirement of Clean Water Communities is that the Stewards identify ten residences that could benefit from RainScaping projects. These projects help manage runoff on private land by leveraging funding opportunities. Silt built up in the South River due to runoff. Credit: JP Morgan.